Having, slightly late to the party, got completely wrapped up in the TV version of Game of Thrones, I figured I'd read George R.R. Martin's original A Song of Ice and Fire books to get caught up and maybe even get ahead of the TV series. I'd wanted to read them for a while but the length put me off, as I only really get time to read on buses and trains and it takes me ages to get through even a shorter book, but as it turns out I finished A Game of Thrones in just under a month. Having some familiarity with the universe and the story obviously helped (it also meant I chuckled every time Jon Snow is described as being close to tears, because I thought "yes, that's the facial expression he can do.") But Martin's prose is also very easy to get on with, detailed without being boring. 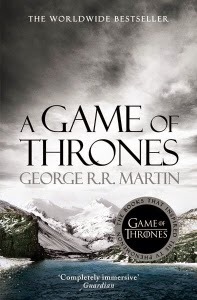 For anyone who's avoided it so far, it's a fantasy novel but the magical elements are kept very much in the background, the main sweep of the story starting with a murder mystery of sorts, the "Hand of the King" of Westeros having met with a suspicious end. The new Hand, Ned Stark, investigates and discovers that his predecessor might have come across a secret that puts the whole line of succession in question, meaning by the end of the book there's numerous claims on the throne, but only after a lot more backstabbing (metaphorical and literal) and intrigue have gone on. I don't think I'll read the rest of the series so far in one go (five books published so far, seven if you count the fact that two of them have been split into two volumes each) because I like to mix my reading up a bit, but I am going straight on to A Clash of Kings because I'm happily back in the Ice and Fire universe for now. I'd heard this first book was the one the TV series stuck to most closely, and it is indeed pretty much identical to the first season; I'm interested to see how the two versions diverge a bit more from now on.